The arthropod-borne protozoan parasitoses caused by Plasmodium sp have produced incalculable human misery, morbidity, and mortality since antiquity; it is clear that Plasmodium sp is related to the coccidia (Chap. 4) (Bruce-Chwatt 1988a), and that the primate-vector cycle was established around 30 million years ago. It seems certain that early man, in the cradle of civilization of Africa (Stringer 1988; Stringer and Andrews 1988), must have been subjected to this group of infections. ‘Malaria’, which replaced the older term ague during the eighteenth century and is derived from the Italian description mal aria (poisonous air), is not a single disease. 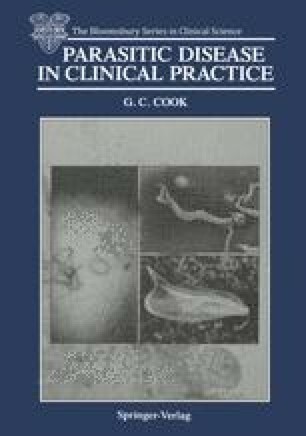 Human infection by four separate protozoan parasites belonging to the genus Plasmodium (which probably evolved from intestinal coccidia millions of years ago), presents as four diverse and characteristic clinical entities (Spencer and Strickland 1984; Bruce-Chwatt 1985; Haworth 1987; Cook 1989a). That produced by P falciparum causes an acute and potentially lethal illness (‘malignant tertian’ malaria, in the older terminology) while at the opposite end of the spectrum, P malariae produces a very chronic infection that may continue, often without serious morbidity, for 50 years or more (Table 1.1.). Diseases with intermediate clinical presentations result from infection with P vivax and P ovale; though neither is characteristically associated with acute mortality or great chronicity, both result in considerable subacute morbidity.